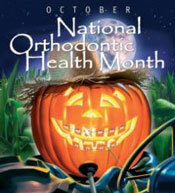 Did you know that October is National Orthodontic Health Month? Honig Orthodontics want you to join us in celebrating the power of a smile during October. You only get one chance to make a first impression, no matter what your age 12, 16 or 60! A perfect smile is one of your best and lifelong assets. Whether you are meeting new friends or interviewing for a job, a smile is important to building both personal and business relationships. It is a well-known fact that straight teeth and a great smile build self-esteem, confidence, and influences how you present yourself to the world. Orthodontic treatment is an investment in the future. Our goal this year is to spread the word in the Newark and Middleton DE area that October is National Orthodontic Health Month and its purpose is to reinforce the need for an orthodontic evaluation. You are never too young or too old if your bite or smile needs correction. The American Association of Orthodontics recNewRommends that parents have their kids evaluated for orthodontic treatment by age 7. Children undergo a major growth spurt during the ages of 7 – 10 that goes hand in hand with the eruptive pattern of their teeth and development of jaws. Starting at the right time, based on your child’s individual growth pattern, can prevent more long-term or difficult treatment later on. Potential problems can be addressed if they are found at the appropriate time. We all know the job market is tight, especially for recent college graduatesNeward . First impressions are everything and serious job hunters are “Bracing Themselves for the Future” to promote their success. Your smile during the interview process, no matter what your age, makes a difference when landing a new job. It also helps you perform better throughout your life to boost your confidence when communicating with others on all levels, both professionally and personally. Currently, more than one million patients in North America are receiving adult orthodontic treatment from orthodontists. Honig Orthodontics offers the latest in treatment options for adults orthodontics, including Invisalign, the “braceless alternative” to straight teeth. It is never too late to receive a beautiful healthy smile for a lifetime. Contact our office today to schedule a complimentary smile exam to find out how we can help you create a smile for the future.